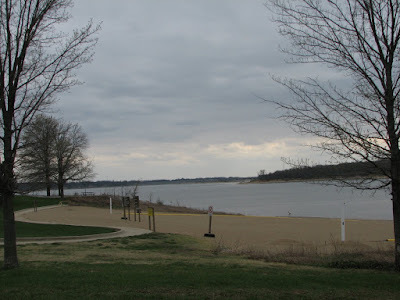 Hello from site # 55 Bluestream loop, Ray Behrens Campground, Mark Twain Lake, Missouri. Trevor came back to Quincy for a dentist appointment on Friday so Ken and I stayed home Friday evening. We had a nice dinner with him at Lakeview. Hard to believe that in only 2 months he’ll be able to go out there and order a pitcher of Warsteiner with his legal age 21 ID. Trev packed up to head back to Charleston on Saturday since it’s their last weekend of school and, of course, that means parties that can’t be missed!! Since I had traveled for work the prior weekend, I decided to take Monday off so Ken and I could get in a few days of camping this weekend. We got to Ray Behrens campground at about 2pm. Ken had reserved an ‘electric-only’ site. I guess it was lucky that he did since when we checked in they were already at 140 of the 160 capacity. And we’ve found that not just any old site will do. The last time we were here we found that the 4.13 down hill slope on site #36 was about the max we good handle and still have ‘baby’ comfortably level with all 6 wheels still firmly planted after leveling. Ken checked in advance that good ol’ site #55 had only a 1.78 inch slope. No problemo! It was the first time we got to use our new patio mat which is a big deal for me since I love to run barefoot and this mat is big enough to run from the door to under the awning so I can run around most times without need for shoes. .
We do almost all our cooking on our outside stove/grill now, even if it’s the bacon and eggs or warming up soup. 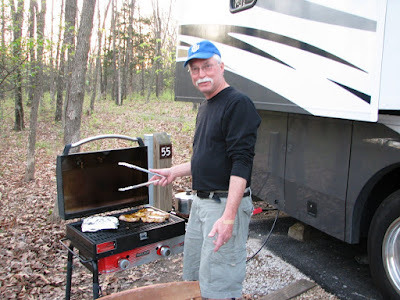 Saturday night, Ken grilled pork loin in a honey mustard glaze, while I had wild rice going in the pan behind him and fresh asparagus in garlic butter sauce in the foil. The extra pork loin, thin sliced, made a great salad topping for the next day’s lunch. Once in awhile, I’m trying to throw some pictures in like the one above, showing the interior of the coach since I’ve gotten requests for that! I couldn’t come up with any creative way to throw in some bedroom pictures so …. Lot's of window's is great for falling asleep to the forest nightsounds and let's us keep the A/C off a bit longer. 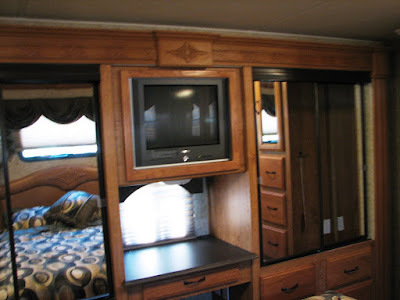 The bedroom has more storage than we'd seen in any other RV this size. We still have plenty of empty cabinets. The TV is a bit of a waste for us since we like to read at night but Ken did use it once already when he wanted to nap at the same time as a Cub's game. That's what he calls watching the game with his eyes closed...well with the Cub's maybe that's the best way!! ;-) The vanity was something I thought I really wanted but don't really use for that purpose. It's nice for Ken and I to each has our own closet for hanging clothes. Oh yes, and everywhere you look there are mirrors!!! We made a major rookie ‘boo-boo’ this trip that will cost us some bucks. I think we have pictures here that will show the lesson learned. 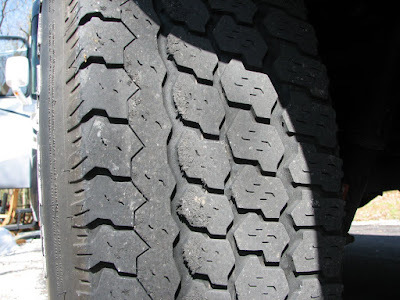 Above you see what the jeep tire should look like, well worn and close to replacement, but got some life yet. 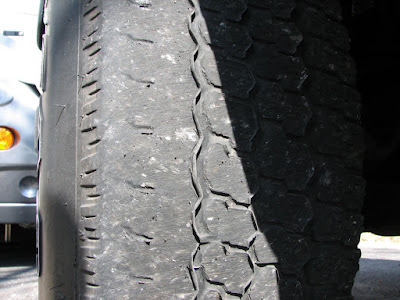 This is what a jeep tire looks like if you forget to unlock the steering before pulling. Ken wanted to get some bigger tires in a few months. I guess now it will be in a few days. This just re-enforces what we’ve been told all along. You make up a checklist and you are meticulous to cross-check every single item before heading out. It was on Ken’s list for the jeep hookup—just go too comfortable with it and didn’t look down the list. 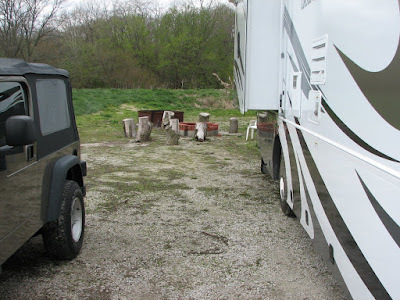 We were very lucky to be only a short distance down the road from the campsite of our friends Jeff and Amy Massman who came by for a visit and tour of our new digs, then invited us over for s’mores at their campfire later Saturday night. Jeff had lots of family on hand and we stayed and enjoyed the company of all these visitors from central Missouri for quite a while. Amy took some pictures so I’m hoping I can get my hands on those for a later addition to this site….right here….Amy??? We are beginning to get our routine down when camping. Ken definitely needs his ‘downtime’ which works out well for walk times or book time or computer time for me. 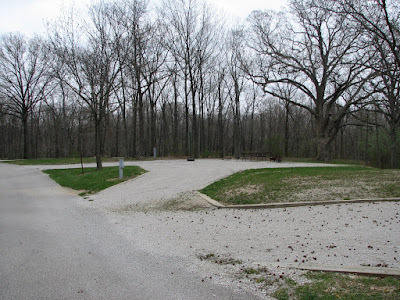 We usually want some exploring time and spent that on Sunday driving both the Ray Behrens and Indian Creek campsite loops, close to 300 sites, marking the map for all our favorite campsites for future reference. The best full hookup sites that are reservable are mostly taken 9 months in advance. We are thinking Ken will try to go over a night early and get one of the non-reserved before the weekend crowd shows. Then I can come over Friday after work. On Memorial Day we’re thinking he may have to try at least 2 days early for that to work! We don’t have to have water/sewer but it’s sure nice to be able to take long hot showers in my own shower after a hike in the woods. We found a ‘short cut’ between Indian Creek and Ray Behrens campgrounds if you don’t mind eating a bit of gravel-road dust. 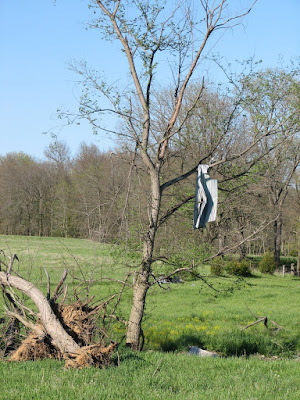 Along the way we noticed a lot of damaged trees and realized that this was where last year’s early-April tornado came through that took out the church in Monroe City. You could still see the path of the tornado by all of the uprooted and twisted trees. Some, like this tree, were still wearing pieces of destroyed buildings. Seeing this really reminded me of Mom since the night that storm hit, the tornado alarms sounded at the nursing home and Ken and I had to move her bed in to the hallway along with all the other residents. It was as that powerful storm, so full of nature’s might and energy, passed by that it seemed to take the last ounces of Mom’s energy with it. Within an hour the nurse’s were telling us we were now at Mom’s last hours to days. Mom was never fully there after that and about 36 hours later was gone. 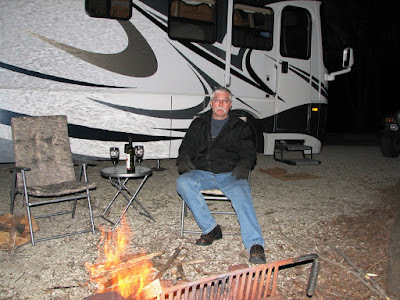 Ken and I had a really enjoyable, quiet Sunday evening with all of the weekend campground crowd gone. It was nearly a full moon and we showered and then enjoyed the campfire and a bottle of Bogle Old Vine Zinfandel http://www.boglewinery.com/factsht.htm#04_OldZin This is one of the better red wine’s I’ve had in a long time, or perhaps, it was the full moon, and the campfire that made it seem even more perfect. The bottle had this old gnarly vine of the label that looked like this…. …Art imitates life…life imitates life??? 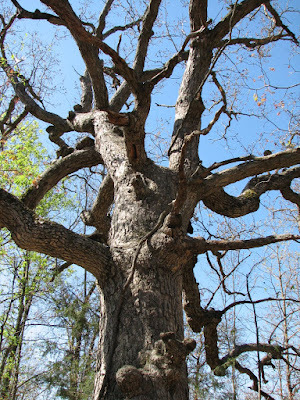 Well I think old and gnarly is beautiful – that’s a good thing, huh, Ken!?!? It seems we are naturally early risers when camping. We’d set both cellphone alarms to be sure I didn’t miss a morning meeting I needed to attend and by the time they sounded at 7am we’d both been up for an hour, dressed, dogs out and ready for the day. My meeting was at 8:00 and optimism that I’d be able to connect both via the internet and via my Cingular blackberry proved to be productive (‘power of positive thinking’!!!). Imagine someone like my father, who has been gone now for 40 years, seeing me able to participate with people from Illinois, Connecticut, Georgia, and Germany in a ‘virtual meeting’ where we all shared the same presentation slides and documents simultaneously and off the cuff via the internet with my Blackberry speakerphone as clear as if I were physically sitting in the meeting room, instead of in the boondocks of Missouri. Amazing when you think how far we’ve come from Dad’s day 40 years ago where ‘party line’ telephones and black-and-white televisions with fuzzy dial-in stations were high-tech! While I was doing my work stuff, Ken had gotten tired of getting ‘snowed on’ by the sawdust leftover in the air conditioning ducts from the coach’s original construction. He popped the vent covers and went around sucking out everything that wasn’t fastened down in those ducts. He got 2 full vacuum canisters of junk. That should reduce the look of dandruff on everything whenever we turn on the A/C. 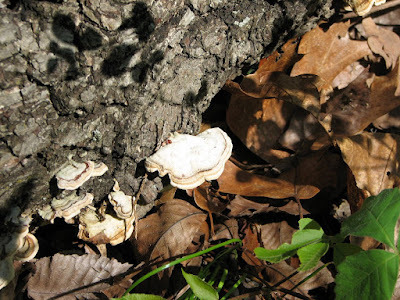 I decided to do some mushroom hunting after by ‘virtual’ meeting. With the duct cleaning detail being about the extent Ken’s Crohn’s disease will allow him in physical exertion for the day, Ken decided to nap. In an hour and ½ of looking under May-Apples and Elm trees, this is what I found…. 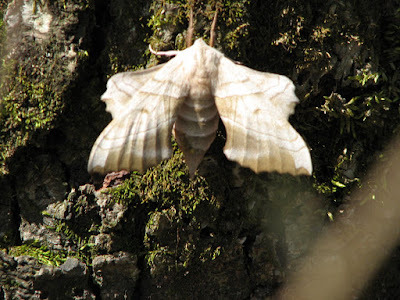 A really elegant moth relaxing on the moss at the base of one elm…. 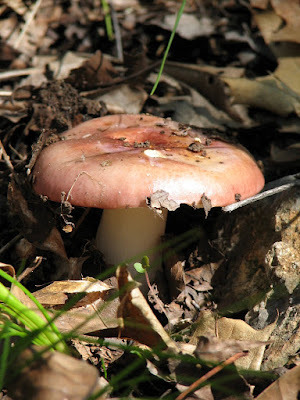 …awe yes, finally a mushroom….ok, well…it was pretty even if I can’t eat it. So that’s it from campsite 55, Bluestream loop, Ray Behrens campgrounds. Another great weekend on wheels even if we didn't bring home any mushrooms! For the first time since we picked up the motorhome, we not only left it parked, but Ken and I actually spent the weekend and most of the next week apart. This year was not an expensive trip since I agreed to speak at the conference which meant my $1600 fee was waived. 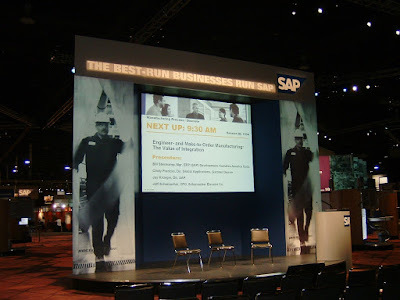 Here is a picture of the stage where I did a presentation jointly with Komatsu, SAP and Schumacher Elevator. We had a packed house with lots of people standing to listen as well. I also spent at least ½ hour afterward answering questions with various users who are considering using some of the same software functionality we currently have installed. The Vendor Show floor was massive. I limited my time there since the vendors seemed to chase you down the aisles for your attention. Most people reading this blog could care less about what I did at the conference during work hours so I’ll just mention some of the fun evening events. SAP always makes sure the non-work hours at these events are top-notch. 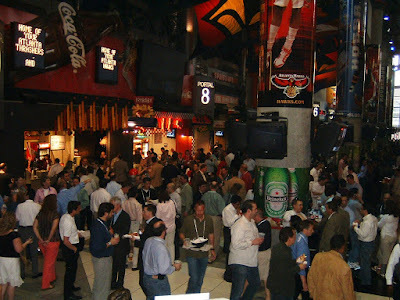 Each evening there were events that always included great food and drink and opportunities to network with other SAP users. 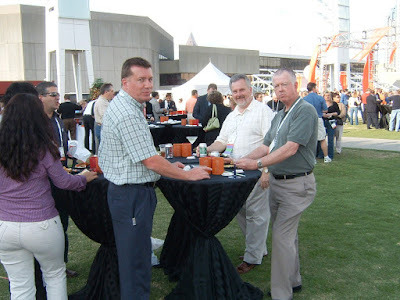 Here’s our Quincy Gardner Denver gang, Mike Holm, Randy Miller and Mike O’Connell enjoying an outside reception. The food/drink theme was around Southern Hospitality with specialties like crab cakes, fried green tomotoes and sweet potato soufflé. In fact, I had my first mint julep…it will be my last…yuck, like drinking spearmint gum!!! The John Mayer concert on Tuesday evening was in the arena where the Atlanta Hawks basketball team and Atlanta Trashers hockey teams play. All of the food and drink venues normally used for the games were open to us for free so we got plenty of pizza, nachos, burgers, popcorn, pretzels….you name it….along with considerable variety of mixed drinks. We had great seats for the concert in the center on the first aisle of the balcony so our view was unobstructed and we didn’t have to climb over anyone to keep a steady stream of refreshment available. 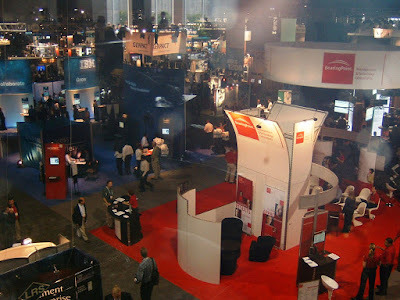 I’ve been going to SAP conferences for 10 years now and I’m always amazed how they get the big names to come in to play for a bunch of computer geeks. They’ve had Stevie Wonder, Rod Stewart, Sheryl Crow and my personal favorite, AeroSmith, just to name a few. John Mayer (www.johnmayer.com) has his fair share of Grammy’s and a current billboard climber you may have heard called ‘Gravity’. Unfortunately, the concert lighting made it impossible to capture any good photos. This was my best attempt of at least getting a picture of John Mayer on stage. While I was in Atlanta, Ken took the opportunity to head over to Charleston to watch some of the Panther football spring practices and scrimmage. 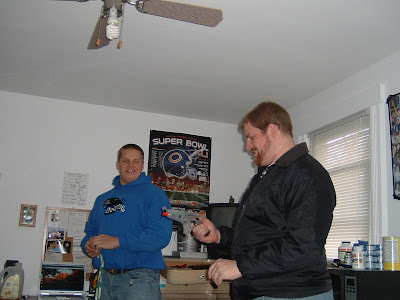 Here’s the first picture we have of Trev in Panther blue. As it turned out, Kevin Mahoney’s Dad, Dennis, came over at the same time as Ken. 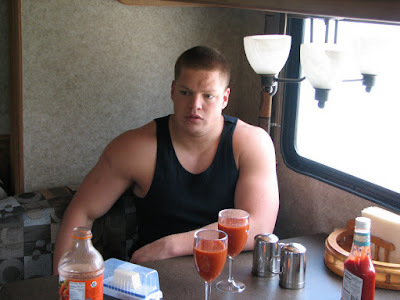 Kevin is the O-Lineman who transferred over with Trev from Bowling Green and shares a house with him now. The father/son foursome was able to spend some time together between practices and scrimmages. 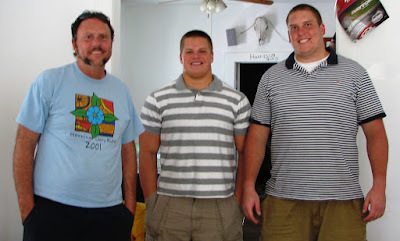 As you can see, Kevin, at about 6'8", 320lbs, can make even Trevor look little! 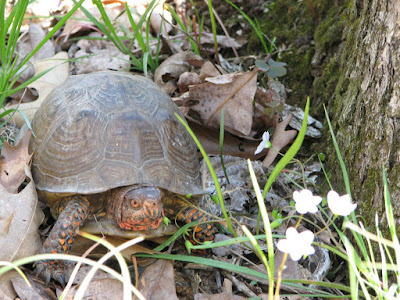 Ken also took the chance to check out the Fox Ridge State Park which is 10 miles south of Charleston. While it is not nearly so nice as Lithia Springs, its much closer and would probably be a good option for some football weekends. The sites are pretty basic, but clean and nestled in the woods. There also appear to be some really nice walking paths. 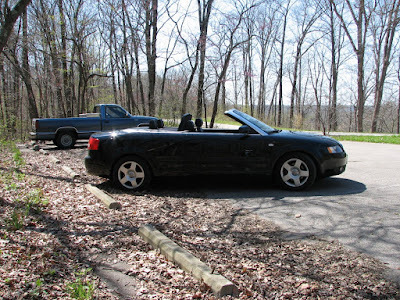 Our Audi seemed a bit out of place in this environment! Ken came down to pick me up from the airport on Wednesday and after a leisurely ride back up highway 79, I was headed back to work to finish out the week, while Ken started preparing for us to have another weekend out in the motorhome. 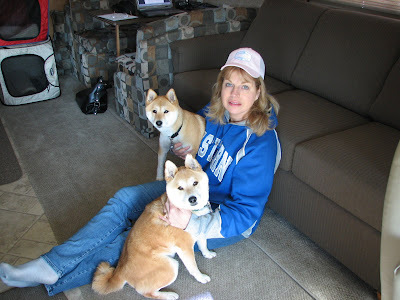 It’s amazing how quickly, especially after a week being herded around with 16,000 other conference attendees, I am longing to jump into the RV, with the hubby and the dogs and get away from it all! 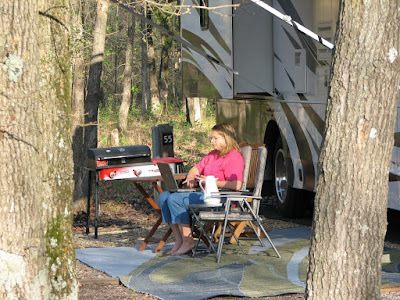 Hope to be writing to you again soon from a comfy and quiet campsite! We started this past weekend with a great plan to get out of Quincy as soon as I was out of work, at least for me! Ken got everything packed and hooked up and picked me up directly in the Gardner Denver parking lot when I got off at lunchtime. I didn’t have to prep anything, just walk out of work and walk in to the weekend! Surprisingly, there was very little wind and we made great time into Iowa. Neither Ken nor I had eaten lunch so we pulled over at the first rest area, past Iowa City on Interstate 80 to take a break and make sandwiches. 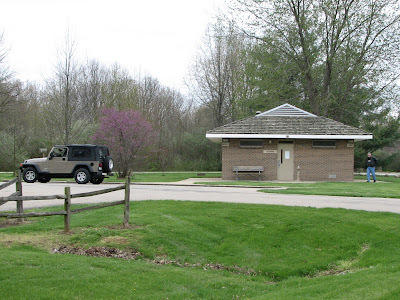 Iowa has really RV-friendly rest areas with wireless internet access AND free dump stations. We didn’t need either of those but Ditka and Sox were really happy for a break. 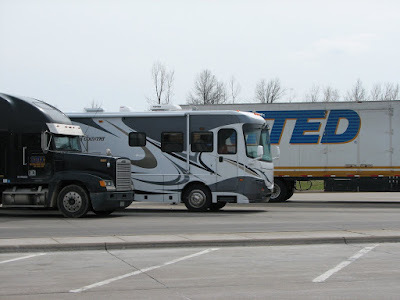 ‘Baby’ (my nickname for the motorhome) got to feel like one of the big boys parked amidst the semi’s. We got to Des Moines Area Community College (DMACC) by 5pm. They said it was fine for us to spend the night on their lot and even provided 30amp electrical service. They have long, paved walking paths around the lake that Sox, Ditka and I enjoyed while Ken kicked back after the drive. 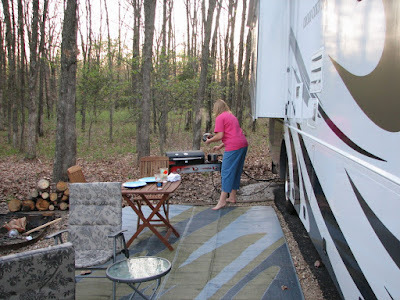 We splurged a bit and did Outback rather than cook in the motorhome. I enjoy their sweet potatoes and chop salad so much that the filet ended up in a to-go box to be snacked on the remainder of the weekend. We ran into a friend of Coach Roc from EIU. This guy recognized the Panther on my shirt and started up a conversation. He coached with Roc at Buena Vista College but now Ken and I can’t remember his name to pass on to Trev to say 'hi' to Roc--- hmmm…is this what 50 is like!!! As it turns out I don’t think we learned a lot new but it was particularly good for me to get to practice backing and negotiating tight turns on a big parking lot where the worst thing I could destroy was a few big orange cones. 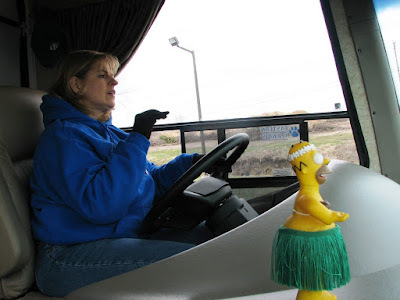 The lady who was suppose to teach the course, a big rig truck driver who also drove RV’s, called in sick and so we had a replacement teacher who had helped with the class a few times but was obviously a ‘stand-in’. I think the DMACC director called him in because he hated to have to cancel on us for a second weekend. Now, you can't go by the look on Homer’s face!...I really did quite well. 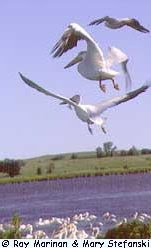 In fact, by the time we were finished I drove across the mile-long bridge over Lake Saylorville and across the dam. The actual big-event of the day had nothing to do with the driving school itself. As I drove near the lake, I noticed a young deer running beside the road and got my speed down to a crawl, not sure when he my bolt in front of me. There was something moving in the fence nearby and I pointed it out. Paul, our instructor, yelled ‘stop’ and was out of the coach before I’d come to a complete stop. There was a big doe, probably the mama of the frantic deer on the road, hanging upside down with its hoof caught in the fence. Paul was brave (or maybe a bit crazy!) about it and worked to detangle the hoof while the deer kicked fought back. People in cars behind us got out to help, or more precisely gawk at what he was doing. Suddenly the deer was free and, amazingly, bounded off, with the little deer at its tail. I guess Paul accomplished his good deed for the day even if I did cause a traffic jam with the rig parked in the middle of the road! In this case, it looked like everyone behind us really did understand the circumstance, with not a single horn honked during the ordeal. 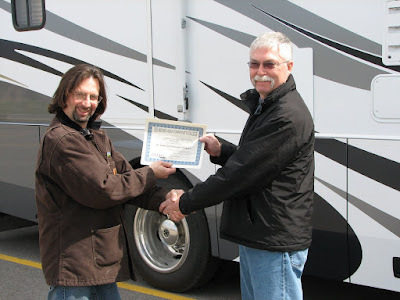 Paul finished out the class by giving us certificates showing we’d completed the course. 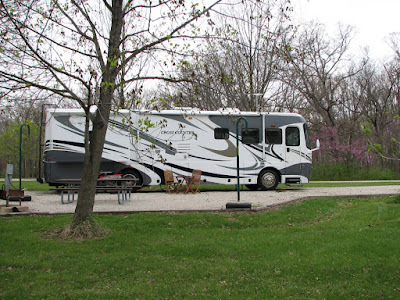 We could stay at DMACC again for the night but decided to head out instead to spend the night in Cherry Glen Campground at Saylorville Lake, just a few miles up the road. The campground was fairly full but this was probably because it was the only Corp or Engineers grounds open in the area before May 1. 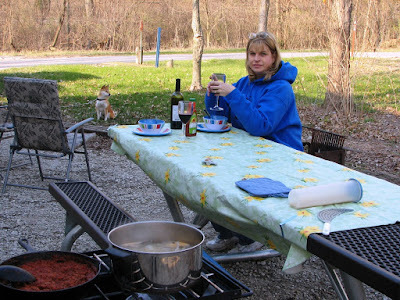 We hadn’t expected we’d leave the DMACC parking lot so had only brought spaghetti to cook rather than anything to grill but somehow it still tastes better when you cook even spaghetti outside. Of course, the bottle of Italian wine we’d packed to complement the meal made it even better. It was a 2003 Montepulciano d’Abruzzo from the wine tasting put on by our friend Becky Vogel who invited us to her first event representing the Traveling Vineyard a few weeks back. We enjoyed a long walk down by the lake after dinner and then sat around the campfire. Sunday was my favorite kind of morning. We just lounged, drank coffee and listened to NPR. We at a late breakfast at about 10:00 and then took the dogs for a walk around the campground. We met the custodians who have lived at Cherry Glen and were just finishing cleaning up one of the biggest messes they’d had since they started there. Apparently some kids trashed the men’s restroom/shower room late the night before and they had peppered the whole interior with wads of toilet paper that were now dried and very difficult to clean up, especially off of the ceilings. I felt really bad for these very nice people but it was good to hear that kind of vandalism is highly unusual. 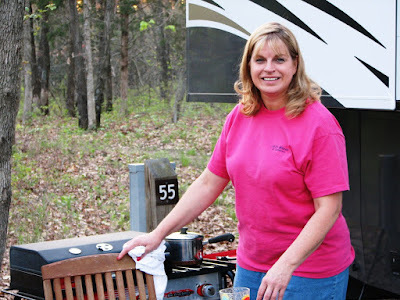 I’m beginning to catch on to the various levels of RVers that help out at these campgrounds. 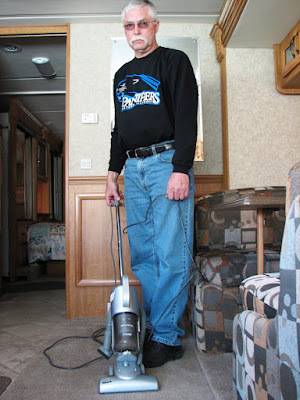 These folks were the actual paid custodians, who kept things clean and were paid for their services above and beyond having the site for their RV. 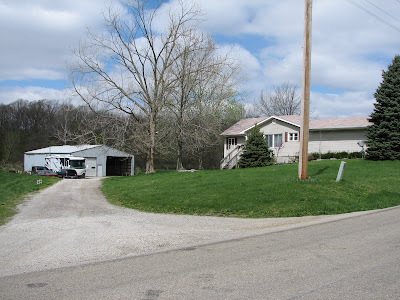 The campground hosts are yet a different level of volunteers who get a full hookup site for 2 or more months for free for helping run the office, mark reserved sites, etc., At least in Iowa there is a third set who for each 3 hours volunteered can get credit for a free base night’s campsite. We were sad to realize that the afternoon had snuck up and we had to pack. We are getting faster and more coordinated on this every outing. We dumped our tanks and hit the road mid-afternoon and as usual I’m updating you here on the blog as Ken drives us back home. We stopped at the new Flying J in Wayland, Missouri, and filled up on diesel. $2.75 which was .15 cheaper than in Quincy but still gave us a final bill of $175 at the pump! But then if you figure 2 nights lodging and 2 night dog boarding, plus eating out all meals...well, yes, ok, I'm rationalizing!! 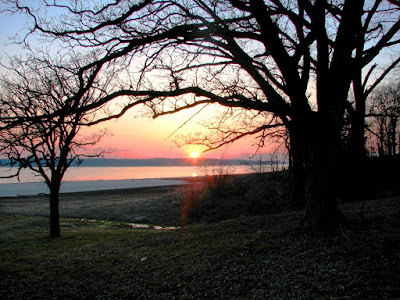 I’ll leave you this time, with a Saylorville Lake sunset…. I’ve found it pretty cool that we are getting our blog visited from all over the globe! 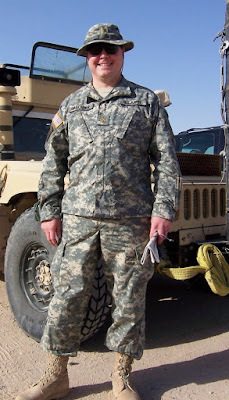 For example, we’ve been getting comments back from our nephew, Joe, who is currently deployed to Kuwait. Antje, my SAP manager (and friend!) 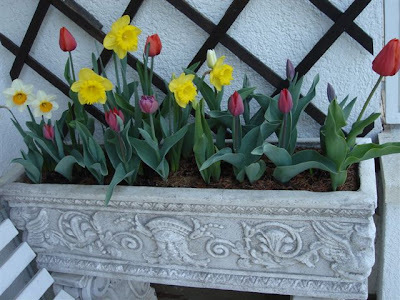 in Puchheim, Germany, was keeping up with the blog over her Easter holiday and sent back to me this lovely flower picture from her garden. Unfortunately the unseasonable cold weather this year has destroyed our tulips so I quess we’ll have to enjoy vicariously through Antje! ---By the way, if you send us 'people' pictures, please let us know if it’s ok to share with friends here. Also wanted to show you one of Ken's recent projects. 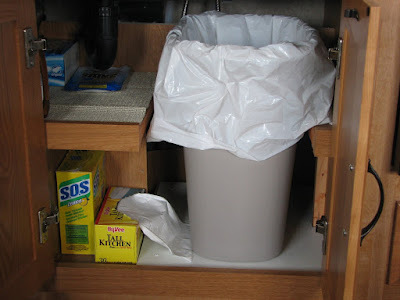 You might remember that early on, I said the only complaint I had on the RV was that there was no place for the trash can. Well, sure enough, Handy-Dandy Kenny to the rescue and with some re-engineering of the layout below the sink, I now have a place for my trash can In the process he lined the bottom with a sheet of vinyl for future easy cleanup. 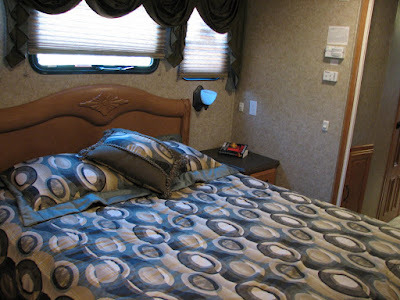 Ok, I guess now I'm down to zero complaints with the motorhome...ah well, I'll come up with something! I also wanted to share with you what has proven to be a great little find. Our Shark vacuum which we picked up for $30 as Shopco. We were surprised at the suction in such a little plastic contraption. It comes apart in all different ways and has lots of extra little hoses and attachments for use on fabric and furniture. 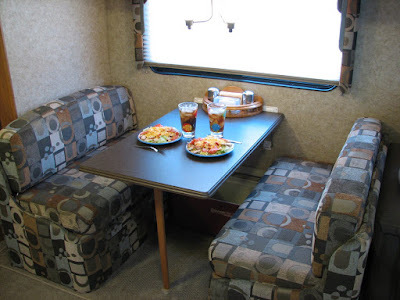 It compacts quick and easy to fit inside one of the dinette bench storage areas. By the way, Handy-Dandy Kenny not included!! We'll be back soon with updates on our next great adventure! This is one of those weekends that turned out nothing like anticipated but even better! I really wanted the whole family together for Easter weekend and Trev was not going to be able to get away from Eastern Illinois University because they are in the middle of spring practice sessions. That meant for us to be together we all needed to all meet in Charleston, IL. As it turns out, Friday afternoon, when we were only ½ hour away from Charleston, Trev called to tell us that the coaches had decided to cancel practices for the remainder of the holiday weekend so the boys could come home. Kyle was also about halfway to Charleston from DeKalb by this time. Ken and I were slow going as, ONCE AGAIN, we were driving in 35mph wind gusts, making the 3 hour trip by car about a 4 hour trip in the coach. 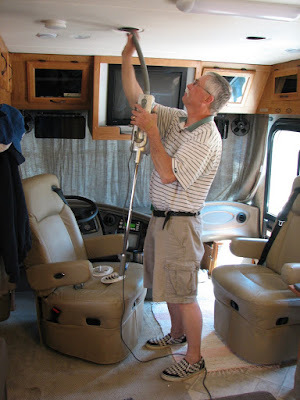 I guess, I never realized we had so much wind in this area in April since Ken has now had 3 of his first 4 RV drives with this kind of fun. Although all Trev’s football friends we’d hoped to meet were now on their way out of Charleston, we decided to go ahead and make a weekend of it in ‘Chucktown’. The father of one of the players owns 5 acres outside town with a house he rents to football players so we were told we were welcome to park there. Ken didn’t want to impose too much so we didn’t hook up electricity though that was offered as well. We were only 5 minutes away from the center of campus so after dropping the jeep we road with Trev back in to town to do a little shopping for some EIU-wear. Ken got a picture of me here in HIS new EIU hoodie. I couldn’t wear the one I bought for myself since it was identical to the one Trevor had on and no guy wants to be seen dress like his Mom! I don’t have to worry about any of the guys taking off with my new pink EIU hat for sure. We hooked up with Kyle when he reached Charleston and headed to see Trev’s house that he shares with 3 other football players. 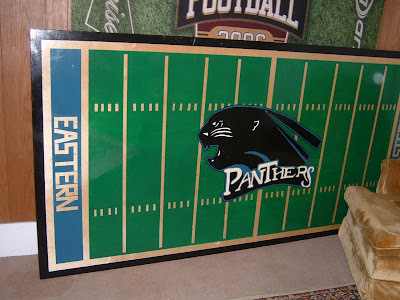 Similar to the one he painted at Bowling Green, Trev now has painted the house ‘beer pong’ table with the Panther mascot at center. If you’ve never played ‘beer pong’ well it’s a college party thing…you can probably figure out the rest. Note the 'Frerx' license plate above the bed! 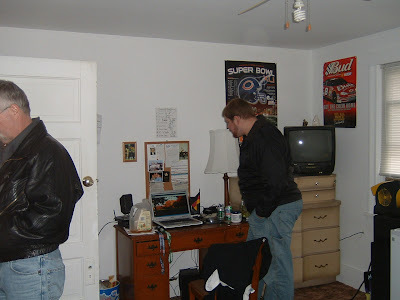 Compared to the ‘public areas’ of the house, Trev’s room was in fairly respectable order. Kyle immediately found one of Trev’s toys in his bedroom, a gun that shoots some little rubber pellets that sting like crazy! --- of course, Mom said they had to put it away before they put somebody’s eye out!. 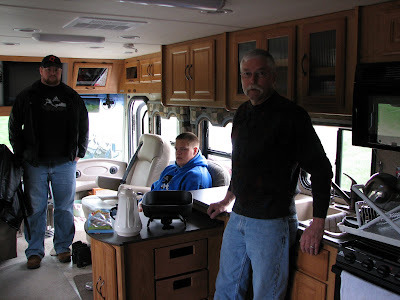 We decided to eat at that Panther Paw, a popular local bar and grill, and then headed back to the RV with the boys making a beer stop on the way. James, the last of the guys from the house where we were boondocking came down to share a few beers. The guys decided to head up to the house to play pool and I hit the sack. 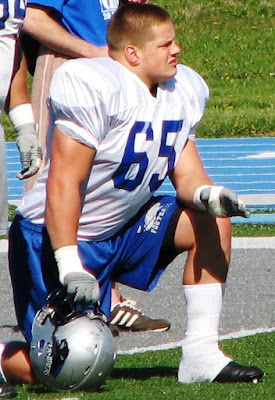 Apparently a recruit out of U of Wisconsin came down to EIU this weekend. Even though he’d been told it was a really bad weekend for a visit, it was apparently the only opening he could find. He and the host player and a few other guys showed up at about midnight so our guys hung out with them for a bit before coming back to the coach to hit the sack. Saturday started early with some excitement about 3:45a.m. when the carbon monoxide detector went off. Of course I panicked and started opening windows everywhere assuming we had messed up somehow with the furnace in this extreme cold (20 degrees) while Ken more methodically checked things out. What had happened was that we had been running the lights, TV, furnace blower, etc., all afternoon and evening on battery/inverter and the carbon monoxide detector was actually complaining about low voltage. Ken popped on the generator and all was well. I got up at 6:15am. After two weeks with only Ken and I, the inconvenience of having the sleeper sofa out in middle of the room got frustrating quickly. While Kyle tried to sleep, I kept walking back and forth on his bed. 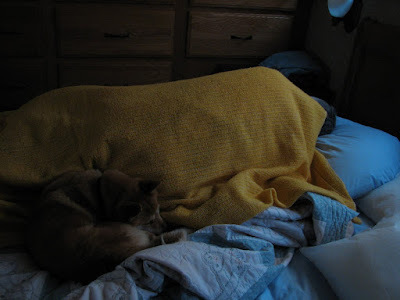 I figured the generator had enough time to do its charging act so turned it back off and, rather than wake the crew with my jostling about, headed outside with the two dogs since, they too, were finding ways to making sleeping difficult for the guys now that it was daylight and time to play. 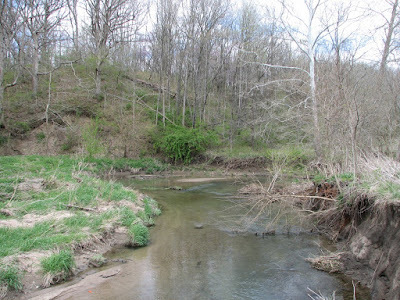 Ditka, Sox and I walked to the back of the property where there is a creek and the dogs were having a hey-day trying to root what I hope were field mice or moles out of their nests. Then we walked the road in front of the house up to the Charleston country club and back. This is really a perfect place to setup when coming to visit Trevor. Very close to campus, but plenty of room to wander. In fact there is a place behind where we parked where the players have a fire ring so I’m sure on autumn evenings after games this place draws a few victory celebrations! Drew has indicated there’s no problem with us parking here but we’ll want to try to talk to his Dad before we come up again. After coming back into the coach out of the cold, Ditka decided Ken still had the best idea and took my place cuddled up in bed next to him. We decided to spend the night tonight at Lake Shelbyville since Trevor now has no reason he has to stay close to campus. We decided to feed the crew and head out. Here’s Trev waiting for us to get the food on the table. As you can see, it’s a bit of a tight squeeze with these guys for four of us to sit at the table. Ken made the guys a really nice breakfast of sausage, fried potatoes, eggs, toast and juice. 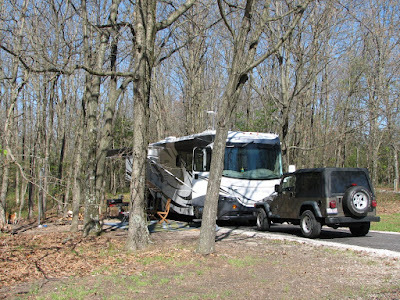 We selected the Lithia Springs campground and were put in a very comfortable full hookup site. 9 of the 11 full hookup sites were taken, which was surprising on such a cold and blustery weekend. It turned out to be a really nice weekend for just the four of us. We watched some of the Master’s golf tournament, the guys took the dogs on a hike along the lake, we watched a Will Ferrel DVD, ‘Stranger than Fiction’ and then did dinner. We did a retry of the first meal we did on our maiden voyage…wild sockeye salmon, alfredo noodles and fresh asparagus, and a nice bottle of wine I’d received for my birthday. Ken did great with the grill this time and the salmon with his sauce of olive oil, Italian seasonings, and crushed red pepper was awesome. For those who heard we were having problems getting the grill attached to the coach LP gas, here’s a picture of what Ken ended up doing. It was originally set up with the ‘T’ in front of the regulator to make it a high pressure line to the grill. As it turns out this is the way you should set up if you are going to be attaching to a grill that uses the little Coleman propane bottles. 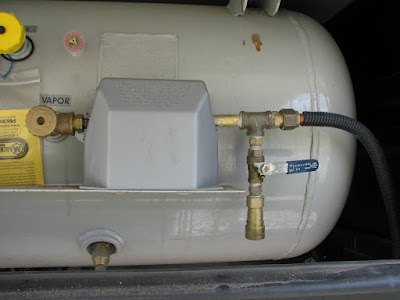 After consulting the grill manufacturer, Ken was told that the grill operates on 1lb of pressure or less so he put the ‘T’, the shutoff valve and the quick-couple after the regulator, all designed for use specifically with LP, of course. Of course, as Ken did, it’s very important when messing with this stuff that you talked to the experts before messing with LP gas connections. 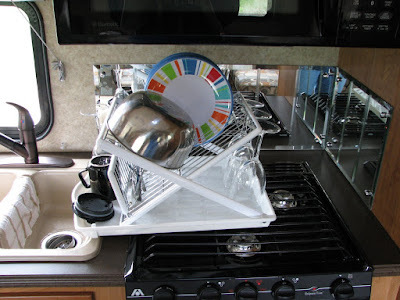 After dinner and dishes…(by the way, I LOVE my really slick little fold up dish strainer) we played euchre. I can’t tell you how long it’s been since the four of us were able to sit down and play games like this. It was wonderful, especially since Kyle and I tromped Ken and Trev! Since I’m the early to rise, I was the first to poop out. It is nice to have multiple slides to section of the bedroom and bath areas so the guys could stay up, watch more movies, snack and get set for bed with me sound too sleep already. Easter morning, I hit the trail again with the dogs. 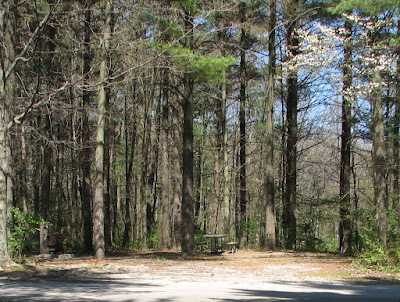 Lithia Springs is a Corp of Engineers campsite and has really great facilities. 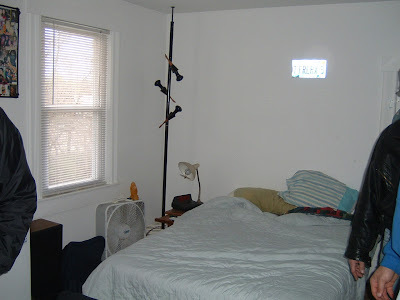 Although they have only 11 full hookup sites, they have lots of really great electric sites. Ken and I really liked #6 which was a pull-thru across from the showers and only a short walk to the beach. It would also have room for a couple of tents if some of the football players wanted to come over and join us for the weekend. With the temperature barely breaking the freezing mark is was very quiet on the lake and, of course, the beach. This time when the dogs got back in side from our walk, Sox decided to join Trevor. 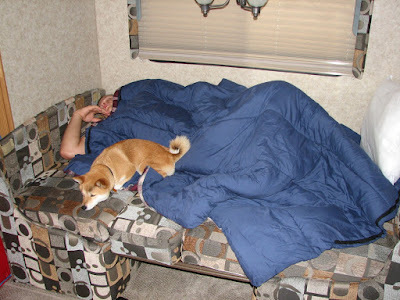 I was pleasantly surprised that Trevor’s full 6’2” was able to sleep on the made-out dinette. Kyle once again kept to the sleeper sofa. 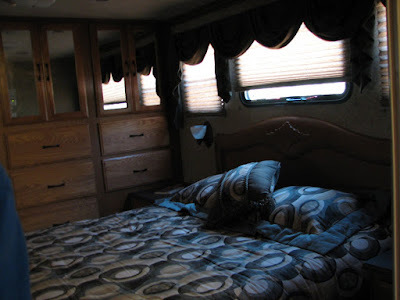 Even though we had full hookups the showerhouse was nearby and very comfortable so the guys headed over there so they didn’t have to line up for showers in the RV. That also gave me a chance to take a really long, hot shower while they were away. Ken did a really great Easter breakfast for everyone again. Then we packed up Kyle so he could get back on the road to Dekalb. We drove Trevor back in to Charleston, folded his laundry, and then about 1:30pm we went to Roc’s Black Front restaurant. Other guys on the team had suggested this for us for Easter. They has a buffet that could satisfy even Trev’s appetite. (Although this weekend has been a disaster for my diet!!). We dropped Trev back at his house and headed back to Lithia Springs. A historic marker caught my eye in Gay, Illinois, and we went by to check it out. 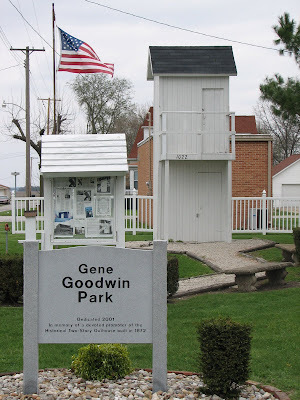 The tourist attraction in Gay is this 2-story outhouse, built in 1872. 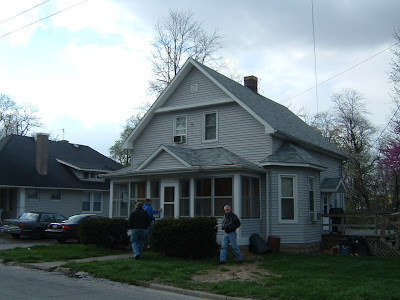 It really was a working outhouse at one time for a 2-story building with the tenants on the second floor stepping out on a back staircase to use the upper floor. Ken and I went back to the campsite to pack up. We are getting better at this. We didn’t get back to the campsite until 3:15 and were pulling out by 4:15. The systems analyst in me, however, is looking for ways for some process improvements here and I’m sure I can cut our time in half in no time if we get more consistent on splitting our duties. Right now Ken wants me following him around doing everything so I’m able to handle it on my own if needed. Good idea but I get real antsy following someone around watching them do stuff or having him follow behind me second checking everything I do. We decided to do 2-lanes back as far as Jacksonville which was actually quite pleasant, especially since there was VERY LITTLE WIND!!! Hurray!! Well it’s time to shutdown our ‘adventures’ for this weekend. We’re already setting our course for the next adventure so come back soon!